Chairman of Tata Trusts Ratan N. Tata has said that he will look into the possibility of doing joint research with Andhra University. Participating as chief guest at the Andhra University Alumni Association (AAA) Meet-2018 at the AU Convention Centre on Beach Road here on Monday, Mr. Tata said he was impressed to hear about the laurels of AU during the last nine decades. I am amazed on hearing about the great leadership of the university over the years and its contribution to the country, he said. 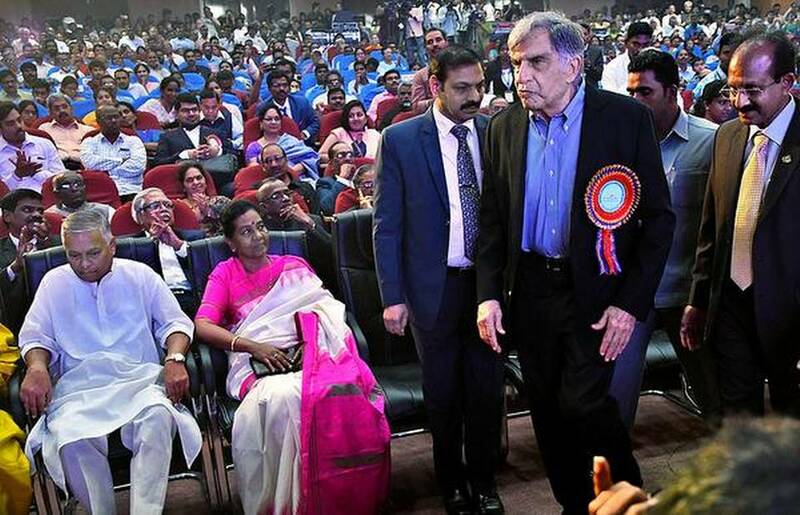 Replying to the requests made by Visakhapatnam MP K. Haribabu and former Tirupati MP V. Varaprasada Rao, Mr. Tata said that universities of today have to come out of their silos and contribute to inter-disciplinary research. They should look towards the industry in this regard. After going back to Bombay (Mumbai), I will discuss with the Tata Group to see what can be done together with Andhra University, he said and added that data analysis, human genomics, sequencing were some of the areas that could be looked into for joint research. Describing Vizag as a dynamic city , he said that he heard it was the cleanest city in India. I am impressed with Andhra University and Vizag. I will remember coming to Vizag and AU for a long time, he said. Minister for HRD Ganta Srinivasa Rao announced that the State government would contribute matching grant to AU to the funds raised by the AAA. He announced that a gold medal would be instituted in honour of the visit of Mr. Ratan Tata to AU. He also appealed to the Tata Trusts Chairman to announce some support to the university. Mr. Haribabu appealed to Mr. Tata to consider establishing a unit of TCS in Visakhapatnam, which he described as the financial, industrial, cultural, tourism and educational capital of the State. Mr. Varaprasada Rao, an alumnus of AU, said it was AU which had taught him to face the challenges in life and overcome them. Andhra University Vice Chancellor G. Nageswara Rao said that the university has been short-listed for granting of the status of Institute of Eminence . If selected, AU would be eligible for funding to the tune of ₹1,000 crore. GMR Group chairman Grandhi Mallikharjuna Rao, who is also chairman of AAA, AU Rector M. Prasada Rao, Registrar K. Niranjan, AAA joint secretary K. Kumar Raja and general secretary B. Mohan Venkata Ram were among those who spoke.